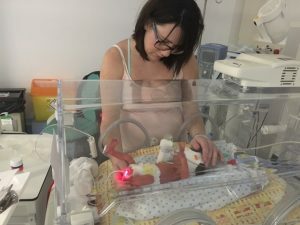 A Welsh mum has taken on a fundraising challenge for the premature and sick baby charity Bliss after almost losing her life during a turbulent pregnancy. Leigh-Ann Wakefield, 33, from Barry was placed under 24-hour observation on the High Dependency Unit at the University Hospital of Wales after being diagnosed with severe pre-eclampsia and being placed on medication to prevent fitting. After suffering hallucinations, the decision was made to perform an emergency c-section in order to save both her and her baby’s lives. In November 2015, Jenson Wakefield was born seven weeks early weighing just 3lb 10oz. It was three days before Leigh-Ann was able to hold Jenson for the first time. He was small but soon began to make progress and the decision was made to transfer him to Prince Charles Hospital in Merthyr because he no longer required the same level of care. Over the next two weeks, Leigh-Ann and her husband Terry, 34, faced a 66-mile round trip from their home to visit their son in hospital. Leigh-Ann was reliant on lifts from her husband and relatives because she was not allowed to drive after her c-section. Jenson continued to make great progress in Merthyr and was soon off his feeding tube and out of the incubator. Finally, almost three weeks after he was born, his parents were allowed to take their son home. He is now a healthy 22-month-old with no lasting complications from his early arrival. Wanting to do something to help parents in the same position, Leigh-Ann chose to take part in the “Go the Distance” Bliss fundraiser to highlight the long distance travelled by parents to visit their premature or sick babies in hospital. Parents of premature and sick babies travel an average of 27 miles a day to visit their little one on the neonatal unit – some even face a commute of 100 miles or more. 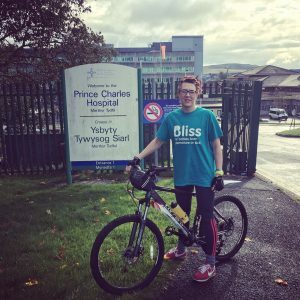 For her fundraiser, Leigh-Ann travelled the distance between the two hospitals Jenson was admitted to in Cardiff and Merthyr on her bike. She was joined by her husband Terry. “I hadn’t been on a bike in nearly two years and was apprehensive about how I would cope. About half way through we ended up following the national cycle route by mistake and found ourselves an hour in the wrong direction. After our unexpected detour we were eventually proud to say we had now cycled a massive 42 miles. 42 miles to raise nearly £270 for this amazing charity. “I wanted to help Bliss because they helped me when I was at my lowest. At a time when I felt slightly numb and didn’t know what to do with myself I made a choice to turn these feelings around and do something positive. Getting my head stuck into something that would give me a focus and know raising any money towards this charity will help other families going through difficult times as we once did. It gives you a sense of pride and achievement in helping a charity that is so close to home,” said Leigh-Ann. Caroline Lee-Davey, Chief executive at Bliss said: “We are so grateful to Leigh-Ann, as well as her husband Terry, for raising money for us. 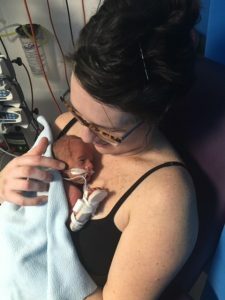 Leigh-Ann and Terry know first-hand what it is like to have a child in need of neonatal care and the difficulties associated with travelling long distances to visit their child in hospital. The Bliss Go the Distance challenge took place throughout the month of September. Participants chose to rack up either 27 or 100 miles any way they wanted by foot, bike or even space hopper.